In December 1789, Henry Luke, the son of Joseph and Elizabeth Cooper was baptised at St. Helen’s Bishopsgate. In due course, Henry Luke is apprenticed to his father who was a member of the Scriveners Company, although he was in fact – as the indenture states – “a cabinet and looking glass manufacturer”. The indenture just vaguely described the place of business of Joseph as Bishopsgate, and the 1814 Post Office Directory has Cooper & Co. at 107 Bishopsgate Within. In 1820, however, an advertisement places Cooper, Elliott and Cooper at number 93. (1) In the following years, many advertisement were placed in the newspapers by the upholsterers, not just in the London papers, but also in The Derby Mercury, The Belfast News-Letter, The Caledonian Mercury and The Ipswich Journal, emphasising that their services were not just local, but that their goods could be delivered to any part of the country. 1830 was not only the year in which Henry Luke extended his business, but it was also the year in which his wife Frances died. As far as I can work out, the couple only had two daughters, Sarah Ann and Frances, and Henry Luke must have been wondering what to do with the upholstery and the agency business when he retired, which he seems to have done in 1838 or thereabouts. While Cooper was still extending his business in the years before his retirement, however, one Thomas Fox, the son of a woollen draper, became the apprentice of James Toplis & Son whom we encounter as auctioneers in St. Paul’s Churchyard in another Tallis Street View. Toplis’s career was similar to Cooper’s in the sense that they also branched out from upholstery into appraising and surveying. Young Thomas Fox saw an opportunity to further his career and went to work for Cooper. When in 1837, Thomas married Jane Toplis, yes, indeed the daughter of his former boss, his address is already given as Bishopsgate Within and in 1838, we find advertisements for Fox as “successor to Henry L. Cooper”. The Conduit Street branch was probably sold to someone else, as Fox was only to be found at 93 Bishopsgate with the same range of goods as Cooper, that is, with any kind of furniture, upholstery or glass you could think of. Thomas Fox variously advertised as the Bishopsgate Plate Glass Warehouse or the Upholstery Warehouse, but he remained at Bishopsgate and when he died in August 1892, his probate record still called him upholsterer of Bishopsgate Street. Various sons worked in the family business and as late as 1912, one of them, Cecil Toplis Fox, describes himself as partner in Thomas Fox & Co. But I like to return to Henry Luke Cooper who was left a widower in 1830. The first census of 1841, shows him living at Trafalgar Square with two female servants, Mary and Ann Calton. Trafalgar Square was also the address given in 1838 for his two daughters Sarah Ann and Frances when they got married. Henry Luke is then described as “Gent.”, already suggesting retirement, although he is still listed as the proprietor in Tallis’s Street Views, which were published in ±1839, so either the Tallis booklets were produced earlier than we thought, or Tallis erroneously used the name of Cooper rather than of Fox. Henry Luke died in 1844 and in his will he says that he has provided his two daughters with a “liberal settlement” on their respective marriages, so he feels himself at liberty to dispose of his estate to others. (6) After a few small bequests, he continues: "I give to my housekeeper Ann Calton for her long and faithful services all my household furniture plate linen china glass pictures books wine and liquors". Generous indeed. If Ann Calton should die before Henry Luke, the same goods are to go to her son Henry Luke Calton. Aha, another Henry Luke. If we go back in time, we see a baptism record in 1834 at St. Botolph, Aldgate, for Henry Luke Calton, the son of Henry Luke & Ann. The occupation of Henry Luke sr. is upholsterer. Young Henry Luke had been born in 31 December 1831, so it took a while to get him baptised. Well, anything is possible of course, but I would guess that Ann Calton was more than a housekeeper to Henry Luke Cooper, especially as no Henry Luke Calton senior seems to have existed. But the household goods are not all that Ann gets, as the will continues with the provision that the executors are also to pay her the dividends of two lots of £833/9s/8d in bank annuities. On the death of Ann, the said dividends are to be used for the maintenance of her son Henry Luke. Well, well, modern-day tabloids would have a field day, but let’s just say that the former upholsterer provided generously for his housekeeper and her son. The will continues with pages and pages of directions to his executors, but I will spare you the legalese and leave you with two advertisements of Thomas Fox. (1) The Morning Chronicle, 12 December 1820. (2) Old Bailey case t18240407-34. (3) The London Gazette, 21 March 1826; and The Examiner, 2 July 1826. (4) See for instance, The Derby Mercury, 27 February 1828. John Colley, the son of Richard Colley, a yeoman of Mitcham, Surrey, had been apprenticed in 1808 to his uncle Philip Lawton, Citizen and Barber of Bishopsgate Street. (1) Colley obtained his freedom of the Barbers’ Company in 1815 and two years later, his son John Lawton Colley was born. (2) On the baptism registration for his son, Colley is listed as perfumer of Bishopsgate Street, although no house number is given. He may even have taken over Philip Lawton’s business, but that is not certain. In 1821, daughter Sophia is born, but here again, no house number given. The first time number 28 is mentioned is in 1832 when John’s wife Sarah, just 36 years old, is buried on 14 September at St. Ethelburga’s. The year before Sarah’s demise, son John Lawton is taken on as an apprentice in his father’s business. In December 1824, The Ladies’ Monthly Museum, a fashion magazine, mentioned John Colley as the inventor of a particular head-dress in which “the hair worn in very full curls, to meet on the fore-head; equally full at the top as at the sides. The hair is dressed in large clusters of small bows, or, partly, puffs, and rolled at the back of the head, on the Grecian model”. 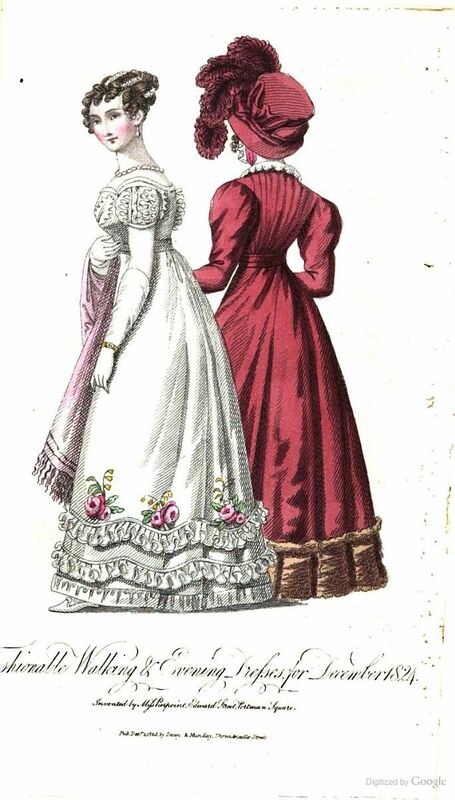 The walking dresses to go with this particular hair style were designed by a Miss Pierpont and shown in an illustration in which the lady in the white dress assumedly has her hair done up in the style invented by Colley. 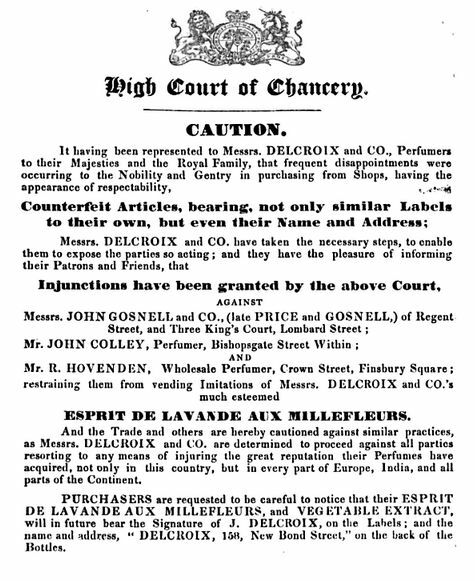 Ten years later, Colley’s was listed in an advertisement in The Spectator as the address where British lavender water manufactured by Henry Capper at the British Perfume Manufactory was being sold. So far, so good, but Capper’s lavender water was not the only variety of that scent sold by Colley’s. 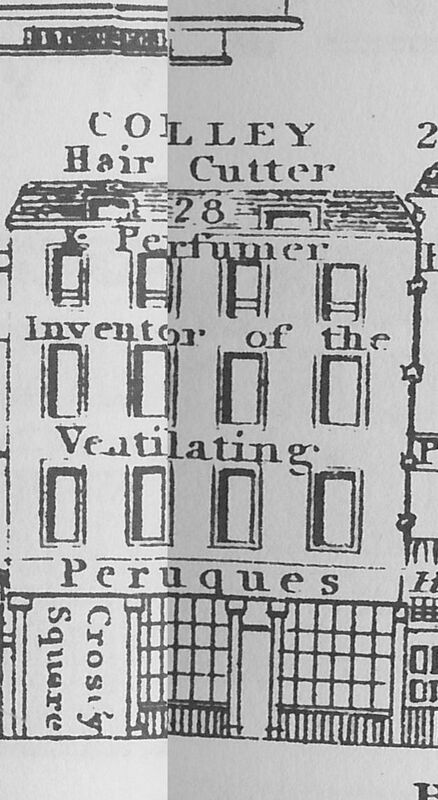 That same year, Messrs. Delcroix of Regent Street, were granted an injunction against three perfumers who sold scented water pretending to be that of Delcroix and Co, while in fact it was just a fraudulent copy. Colley was one of the perfumers “having the appearance of respectability”, but being in fact common swindlers trying to make money imitating Delacroix’s packaging – or so Delacroix claimed anyway. The bad publicity does not seem to have harmed Colley as he happily kept his shop running for quite some years after this incident. 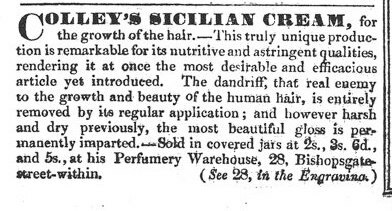 Colley advertised in the Street View booklet with Sicilian Cream, supposedly good for your hair. John Colley and his son John Lawton had entered into a partnership which was dissolved on the 17th of June, 1847. I guess because John wanted to retire, but the notice in The London Gazette does not actually say so. 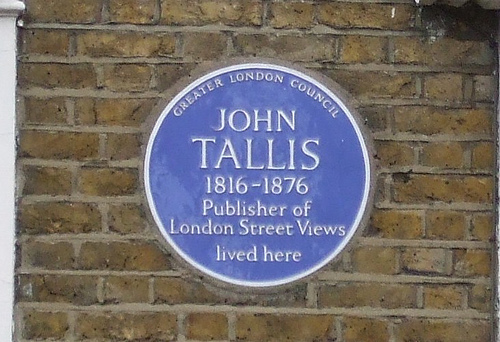 The 1851 census does, however, give John, his second wife Mary and their two children Philip and Reginald Edward at Gypsy Hill, Lambeth, with John described as “landed proprietor”. John died in February 1855 and was buried at Norwood Cemetery. John Lawton could still be found at 28 Bishopsgate Street after his father retired from the business and in 1849 still advertised the Sicilian Cream in The Era of 28 January, no longer just good for your hair, but even preventing baldness. The advertisement refers to Colley’s “thirty years’ experience as a hair cutter” without mentioning the fact that the thirty years were divided up between two generation, albeit of the same family. John Lawton married Cornelia Dear in 1845(5), but the marriage appears to have been childless. The 1851 census sees John Lawton and his wife at 28 Bishopsgate as a hair cutter, employing 6 men. Cornelia seems to have continued the shop after the death of John Lawton in 1859(6) as the 1861 census still finds her at Bishopsgate as perfumer, but by 1871, she had moved to Croydon and had apparently retired. 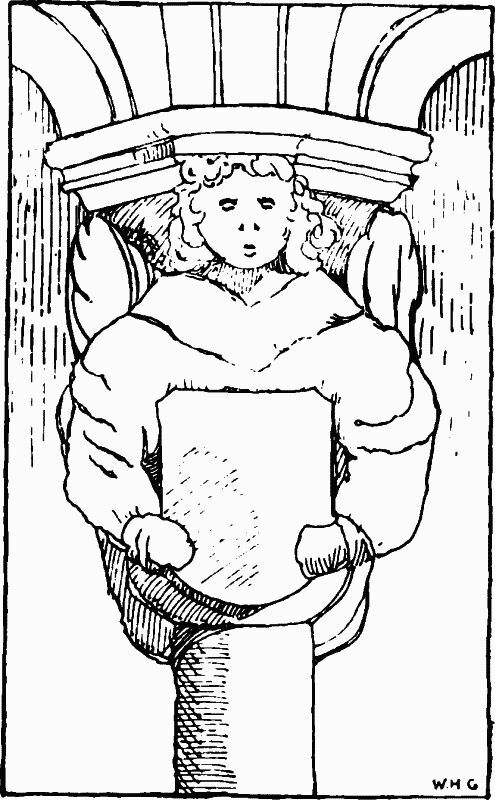 She died in 1886. (7) The shop at number 28 was taken over by Joseph Eglese & Son. (1) National Archives, Kew: PROB/11/2237/208. John Colley is named the executor in Philip Lawton’s will, dated 10 October, 1854, although that commission is revoked in a codicil dated 4 September 1855. Why that is so, remains unsaid. The other executor is named as Joseph (Cox) Dear. See also footnote 5 for the Dear family. (2) John Lawton’s mother was called Sarah, but I have not found a marriage registration that conclusively links a Sarah to the John Colley of Bishopsgate. There are a few possibilities, but none that point without doubt to the correct John Colley. (3) Survey of London Monograph 9, Crosby Place. Originally published by Guild & School of Handicraft, London, 1908. Original online here. Transcription available via British History Online here. (4) Nash and Davis are referred to in the bibliography of the Survey as: MS. Notes and Sketches of Crosby Hall by Frederick Nash and Valentine Davis, in the Library of the Royal Institute (1804) of British Architects. And Blackburn is a reference to An Architectural and Historical Account of Crosby Place. By Edward L. Blackburn. 8vo. London, 1834. (5) He had married Cornelia on 12 July 1845. Her father was given as Joseph Dear, gentleman. Interestingly, a year earlier, John Lawton’s sister Sophia married the reverend Robert Dear whose father was also named Joseph. Were they brother and sister? See footnote 1 for the Joseph Dear who was named the executor of Philip Lawton’s will. Although it is tempting to think that all these Josephs were one and the same person, that may not be the case, although a family relationship is certainly indicated. (6) England & Wales, National Probate Calendar (Index of Wills and Administrations), 1859. He was buried 16 March 1859 at Norwood Cemetery. The service was conducted by Robert Dear, his brother-in-law. (7) England & Wales, National Probate Calendar (Index of Wills and Administrations), 1886. She was buried 7 August 1886 at Norwood Cemetery. 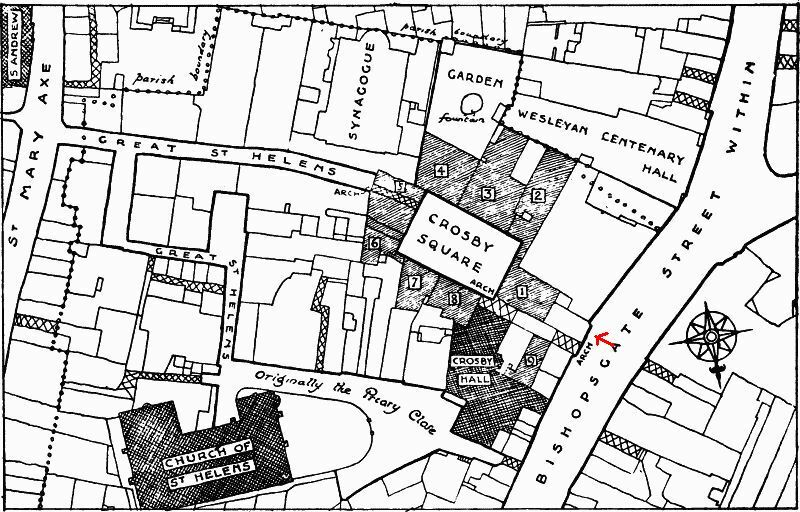 You may also like to read about Charles Snelling, one of Colley’s apprentices who had his shop in Wellington Street and later in Gracechurch Street.